echo "Use to print multiplication table for given number"
This happened because we have not supplied given number for which we want multiplication table, Hence script is showing Error message, Syntax and usage of our script. This is good idea if our program takes some argument, let the user know what is use of the script and how to used the script. In above syntax BEFORE the first iteration, expr1 is evaluated. This is usually used to initialize variables for the loop. All the statements between do and done is executed repeatedly UNTIL the value of expr2 is TRUE. AFTER each iteration of the loop, expr3 is evaluated. This is usually use to increment a loop counter. In above example, first expression (i = 0), is used to set the value variable i to zero. Second expression is condition i.e. all statements between do and done executed as long as expression 2 (i.e continue as long as the value of variable i is less than or equel to 5) is TRUE. Last expression i++ increments the value of i by 1 i.e. it's equivalent to i = i + 1 statement. As you see the if statement can nested, similarly loop statement can be nested. You can nest the for loop. To understand the nesting of for loop see the following shell script. Here, for each value of i the inner loop is cycled through 5 times, with the varible j taking values from 1 to 5. The inner for loop terminates when the value of j exceeds 5, and the outer loop terminets when the value of i exceeds 5. 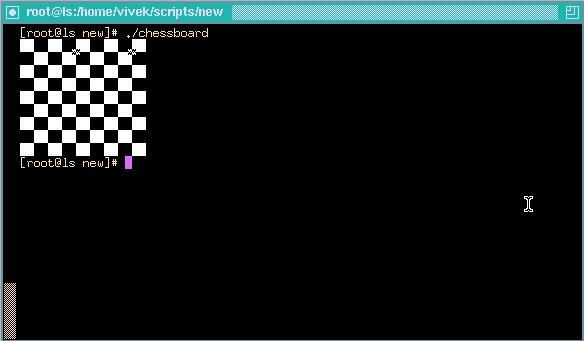 Following script is quite intresting, it prints the chess board on screen. echo -e -n "\033[47m "
echo -e -n "\033[40m "
Begins the inner loop, for each value of i the inner loop is cycled through 9 times, with the varible j taking values from 1 to 9. The inner for loop terminates when the value of j exceeds 9. See for even and odd number positions using these statements. If even number posiotion print the white colour block (using echo -e -n "\033[47m " statement); otherwise for odd postion print the black colour box (using echo -e -n "\033[40m " statement). This statements are responsible to print entier chess board on screen with alternet colours. Make sure its black background as we always have on our terminals. done End of outer loop and shell scripts get terminted by printing the chess board. Try to understand the shell scripts (for loops) shown in exercise chapter.